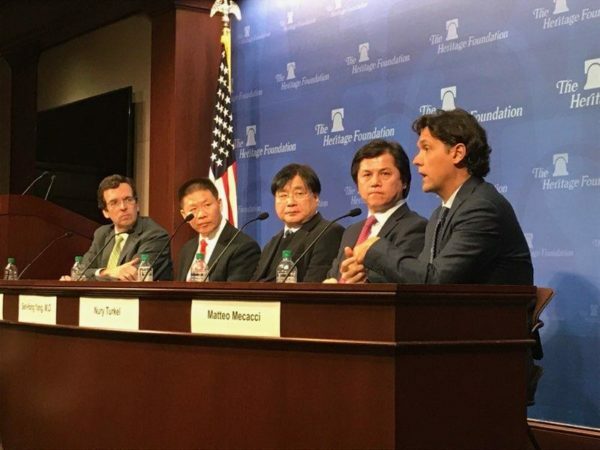 The president of the International Campaign for Tibet (ICT) told a panel discussion at a major think tank in Washington, DC that it is time for democratic governments and international institutions to go after high-ranking Chinese officials who design policies that violate human rights. Speaking at the panel discussion “Evaluating Threats to Religious Freedom in China” at The Heritage Foundation on Feb. 5, 2019, ICT President Matteo Mecacci said that while specific human rights violations against one person or a small group are tragic, more attention should be paid by democratic governments and international institutions to the Chinese leaders whose policies make those violations possible. “What’s important is also to look at the architects of the policies that are being implemented on the larger scale,” Mecacci said, adding that “These individuals should be individually targeted,” whether by freezing their financial assets or denying them visas to enter other countries. The other panelists included speakers from the Uyghur Human Rights Project, ChinaAid and the Taiwan Association for China Human Rights. Mecacci said religious freedom in China has been under attack since the Communist Revolution in 1949—the same year China invaded Tibet. Today, Tibet remains in the iron grip of China’s occupation. Despite Chinese oppression, Mecacci said the people of Tibet have remained overwhelmingly loyal to their Buddhist faith. “I think there is something special in the connection between the Tibetan people and religious freedom and spirituality,” he said. Mecacci said the international community should consider new tools to punish China’s human rights abusers. He cited the US Global Magnitsky Act, which allows the government to impose visa bans and targeted sanctions on foreign officials who are responsible for human rights violations or acts of significant corruption. Recently, a bipartisan group of legislators called for the Magnitsky Act to be used against Chinese officials behind the Uyghur internment camps in Xinjiang (East Turkestan)—including Chen Quanguo, the current Communist Party secretary in Xinjiang who previously held the same position in the Tibet Autonomous Region. Mecacci also mentioned the Reciprocal Access to Tibet Act (RATA) as a way to address China’s human rights violations. RATA, which President Trump signed into law in December 2018, calls for access to Tibet for Americans and requires the State Department to revoke or deny US visas for Chinese officials responsible for keeping US diplomats, journalists and ordinary citizens out of Tibet. Mecacci pointed out the unfairness of Chinese state media outlets having the freedom to operate in Washington, DC and other cities while US media are denied routine access to Tibet. While US leaders have been pushing for reciprocal trade with China, Mecacci said the concept needs to be expanded and that reciprocal access to Tibet can help shine a light on China’s rights violations. “The question of reciprocity, if looked at in a creative way, can offer opportunities to advance human rights,” he said. Watch the “Evaluating Threats to Religious Freedom in China” panel.